Souljourn Yoga invites you to begin 2020 on an epic adventure to the gorgeous, culturally abundant, and truly magical Cape Town, South Africa. Please join Mollie Mendoza, Sam Garrett, and founder of Souljourn Yoga, Jordan Ashley in a stunning villa in Camps Bay where we will start off each morning with yoga, delicious plant-based breakfast f(made by our very own private vegan chef, Arabella of Eat to Thrive) and a fresh adventure from sea to safari. You will be guided by Saffa Tours on a journey that encourages exploration, creativity, and serenity all against the backdrop of this beautiful coastal city that will not only open your senses, but your heart as we enjoy this beautiful balance of excursion, rest, and practice. From ceremony, live music, surfing, hiking table mountain, snorkeling with cape fur seals, township and market tour and so much more, this retreat is honored to have partnered with our sister organization, Lalela Project (a Zulu word that means to “listen”) that uses an arts curriculum to ignite imagination and teach children how to map and manifest their dreams and goals, launching the possibility of a different future for themselves and their communities in townships and inner city youths. Our retreat participants will be volunteering with their Female Empowerment Program with three opportunities to create, connect, and be inspired by these amazing young women through art and movement. Day 1: Welcome to Cape Town! Arrive at Cape Town International Airport and be collected by Saffa Tours, your host for the week, to be transferred to your beachside villa at Camps Bay, one of Cape Town’s most sought after neighborhoods. Spend the rest of the day settling in, relaxing, as well as grounding with an opening circle and yoga practice. Start the week with sundowners at one of Saffa Tours’ secret spots, with gin & tonic, wine, mocktails etc. With a live acoustic set with our very own Sam Garrett, we will begin our journey together. Dinner reservation at one of Cape Town’s most vibrant spots, we will celebrate our adventure to come (dinner included). Begin the day with a vigorous yoga class lead by either Mollie or Jordan, followed by breakfast made by our private vegan chef. Collection from the villa and on to one of the wholesome weekend markets. We will begin the day with a visit to the iconic Cape Town markets where you will be introduced with a vibrant atmosphere and an array of food and local goods for sale, a true experience of South African culture. Under the gaze of Table Mountain your guide will lead you past important historic. Spend a few hours exploring the morning market for tantalizing treats and tasty trinkets. Embark on a City Excursion with Saffa Tours. Explore the city center and its layers of history, rich culture, quaint restaurants, bars, coffee shops and vibrant atmosphere. Some points of interest include the Company’s Garden (the original site of the first European settlers), the City Hall (where Nelson Mandela gave his first speech after being released from prison). The last stop is the neighborhood of Bo -Kaap, formerly known as the Malay Quarter and set on the slopes of Signal Hill. You can also enjoy a walking tour along the cobbled streets and brightly painted houses. Return to to the villa for an evening yoga practice and sound journey. Followed by dinner of your choice. Rise and shine with a stimulating yoga practice with either Mollie or Jordan followed by breakfast made by your private vegan chef. Pick up by Saffa Tours to embark on a tour of the beautiful Cape Peninsula, including Chapman’s Peak Drive; Cape of Good Hope (most SW tip of Africa); and the African Penguin Colony (Boulders Bay). Chapman’s Peak Drive – rated as one of the top ten most scenic drives in the world. On Chapman’s Peak, you can take some photographs before continuing. The next part of the journey is to the ‘countryside’ of Noordhoek, the sleepy surf town of Kommetjie , and along a coastal road. The next stop is the Cape of Good Hope (Cape Point Nature Reserve) – a craggy headland jutting out on the Atlantic Coast. Part of the Table Mountain National Park, this world-renowned landmark is home to a varied collection of wildlife. Your expert guide will expand on the history of the area while you take in the sights at the most southwestern tip of Africa. Gourmet picnic lunch (included) outside in Cape Point Nature Reserve with Veld and Sea, followed by some time to explore the quaint village of Kalk Bay. You may have the opportunity to take a swim in the cool Atlantic Ocean or practice yoga on a completely secluded beach. Boulders Beach is the following stop and you are able to get well acquainted with the African Penguin. Upon entering this idyllic beach in False Bay, learn about this rare species of penguin, found only off the coastlines of Namibia and South Africa. The subsequent destination is one of many old fishing villages on the Atlantic Seaboard – Kalk Bay. Set on the harbor, in amongst the bobbing boats and friendly seals. Kalk Bay is also renowned for their local fish and chips spot, Kalkies, which we could pop into. We can spend the afternoon exploring the gems of this tiny town full of boutique thrift shops, restaurants, coffee shops and galleries. En route back to the city, the tour will take a scenic road past Muizenberg Beach – a popular spot for learning to surf. Return to the villa for time to unwind, relax before our evening yoga session with either Mollie or Jordan and dinner at your own leisure. Early pick up with Saffa Tours before embarking on our Table Mountain Adventure! Begin hiking the wondrous Table Mountain. Take to the skies as we make our way up the Mother City’s crown jewel. Table Mountain is a UNESCO World Heritage Site and World Biodiversity Hotspot. This mountain frames the iconic city of Cape Town and is a proud world symbol of our magical city. We will embark on this moderately challenging hike taking approximately 4 hours. Enjoy an opportunity to for a guided meditation on this crown jewel and have your picnic lunch (included) overlooking the city, followed by the Cable Car trip back down to the city. Take the rest of the afternoon to yourself,visiting the recommended sites in town. Summit Table Mountain and catch the cable car down. Return to town to have the afternoon at leisure. *Please prepare to have dinner before heading back to the villa for our evening ritual. Cacao Ceremony with Heart Songs and Sound Healing. Sam and Mollie will be leading this amazing practice by calling in the sacred medicine of Cacao with a heart opening ceremony, we will bring our intentions into fruition with ritual, and an alchemy of expression, sound and silence. Rise and shine with an invigorating yoga class led by either Mollie or Jordan yoga followed by breakfast made by your private vegan chef. Collection by Saffa Tours to travel to the Game Reserve, approximately 3 hours from Cape Town. As a private game reserve, Aquila’s purpose is to protect and preserve Africa’s increasingly threatened wildlife and is fully committed to social impact, job creation, skills development and various sustainable empowerment programs. Hopefully we will experience this amazing wildlife and see the Big Five as we hop on a 3-hour safari, finishing off with a delicious buffet lunch. After a long day of exploring the African wilderness, we will spend the rest of the day at the lodge at leisure. Relaxing, enjoying the spa, the pool and the wild scenery, as well as an opportunity to take a yoga class amongst it all. We will then make our way to the Winelands for some relaxation. 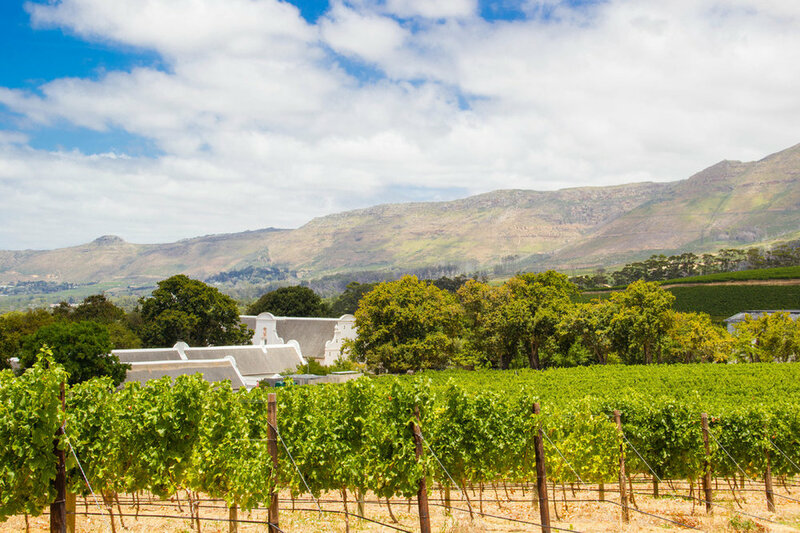 About 40 km to the east of Cape Town, lying in the shadow of a continuous belt of Cape fold mountains, lies a series of generous valleys known as the Cape Winelands – a collection of historic towns, little hamlets and Cape Dutch farmsteads that provide well-regarded South African wines to the world. These mountains create an incredible scenic backdrop for a myriad vines, but they are also one of the reasons wines do so well here. We will taste a few wines and enjoy the scenic vineyards of the Western Cape Wine Region and pair that with a delicious dinner experience. You will spend the night in the beautiful Winelands and wake up to rolling green hills and vineyards. Dinner reservation at a sought after restaurant in the Winelands (included). Begin the day with a yoga class lead by either Mollie or Jordan followed by our curated plant based breakfast. Collection by Saffa Tours to explore the Winelands area. Start the next day in the oasis of Babylonstoren, a historic farm in the Winelands. Come together to the Healing Garden and enjoy the local tea ritual and workshop or a fynbos infused perfume workshop. From there we will continue into a wine tasting and delectable lunch. On our way through the winelands en route back to Cape Town we will stop for another amazing cheese (vegan options available) and wine pairing. Arrive back at the accommodation in Cape Town. Enjoy a mellow yoga practice and sound bath. Dinner followed at your own leisure. Wake up to yoga either led by Mollie or Jordan followed by a delicious breakfast by your private vegan chef. Collection by Saffa Tours to head to the infamous Muizenburg Beach, known for its beauty and beginner waves. Surf Lesson with Saffa Tours and beach time at leisure. Grab a bite to eat at a local coffee shop and be ready for a day of fun and adventure. Visit Lalela to meet the amazing girl of the the Female Empowerment Program for an afternoon of yoga and art. Return to the accommodation. Evening yoga session with either Mollie or Jordan followed by dinner together of our choice. Collection by Saffa Tours to head to the quaint fishing village of Hout Bay. Here we will catch a boat ride out to Seal Island and enjoy viewing the seals up close and personal. Hop on a boat and go snorkeling with the Cape Fur Seals. There is an opportunity to dive into the Atlantic Ocean and spend an hour or so swimming and playing with the seals before jumping back into the boat. All wetsuits and equipment will be provided. From there we will head back into the harbor to enjoy an amazing fish and chips for lunch, a classic local meal from Hout Bay. Here we can pop into the Teabag Factory which makes art from used teabags. Visit Lalela to meet the amazing girls of the the Female Empowerment Program for an afternoon of yoga and art. There is the option to go to the Hout Bay Habour Market which is very close to Lalela before heading back to the Villa for an early bite. Return to the villa for Heart Song Ceremony with Sam and Mollie. Through coming together in Ceremony we honour the practice of gathering, connecting, & sharing. Weaving Kirtan, Mantra and Medicine Songs from different traditions, we explore the heart of sound, meditation and free expression. Our last full day together! Wake up to with a yoga session and live music led by Mollie or Jordan followed by breakfast made by your private vegan chef. Collection by Saffa Tours to head to the Imizamo Yethu Township tour to visit the families and students of the Lalela Project. We will take a 2- 3 hour walking tour through the township 'Imizamo Yethu' in Hout Bay by a local guide who lives there. Because he lives in Imizamo Yethu himself, he is the ideal person to explain the way of life and history of this township to you. The township tour is one of the most interesting and important travel experiences in South Africa. We will finish off with a local ‘lekker’ lunch. Afternoon at your leisure to get some last minute shopping done or exploring. Last day to visit Lalela to meet the amazing girls of the the Female Empowerment Program for an afternoon of yoga and art. Return to the villa for our closing practice and circle with Sam, Mollie, and Jordan. Dinner reservation at 4 Roomed eKasi in the Khayelitsha Township (included). Relax, sleep in, and enjoy a leisurely by breakfast made by your private vegan chef. Day of leisure before heading off to the airport. *** Please note that we ask you to keep and open mind and a “go with the flow” attitude as we will be in a different country and things sometimes can get delayed or adjusted due to circumstances out of our control. So, embrace the spirit of adventure and enjoy your epic journey that awaits you!